Geothermal energy is recovered energy from the heat generated deep inside the earth. It is one of the renewable energy sources as the heat is continuously generated in the earth core from the slow decay of the radioactive particles. 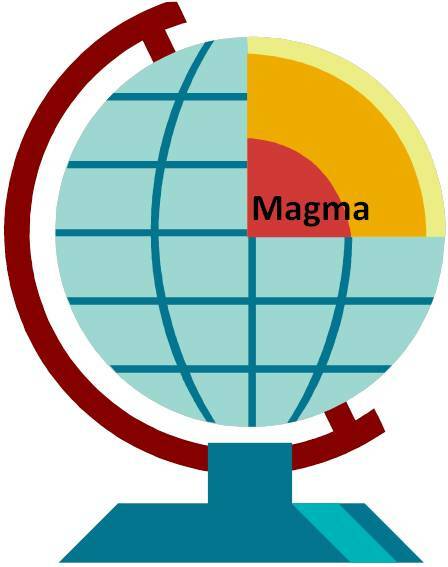 The earth core is made of solid iron covered by very hot melted rock, called magma. This magma can come closer to earth surface as volcanoes or erupts as lava. Rock and water absorb the heat from this magma and get hotter and hotter as it gets deeper. The most active geothermal resources are usually found along major tectonic plate boundaries where earthquakes and volcanoes are concentrated. One of the most active geothermal areas in the world is called the “Ring of Fire”. 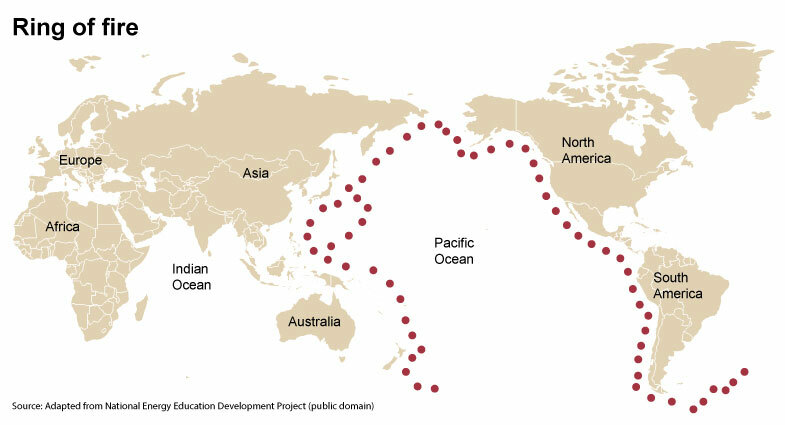 The Ring of Fire rims the Pacific Ocean and is bounded by Japan, the Philippines, the Aleutian Islands, North America, Central America, and South America. The hot water that carries earth warmth and emerges near the surface as hot spring or reservoir can be used directly for beneficial usage. Other than bathing, the most common use of this hot water is piping it directly in the heating system of both residential buildings as well as commercial industries. Almost everywhere ground temperature, generally 10 feet below from the top surface stays in the range of 10 to 16 degree centigrade. As a result, the surrounding soil temperatures are warmer than the air in winter and cooler than the air in summer. 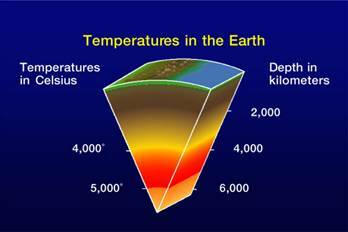 This stable earth temperature can be recovered and utilized for different usage like to heat and cool buildings. This can be done through a geothermal pump system that transfers recovered heat through hot water to buildings in winter, and reverse in the summer. 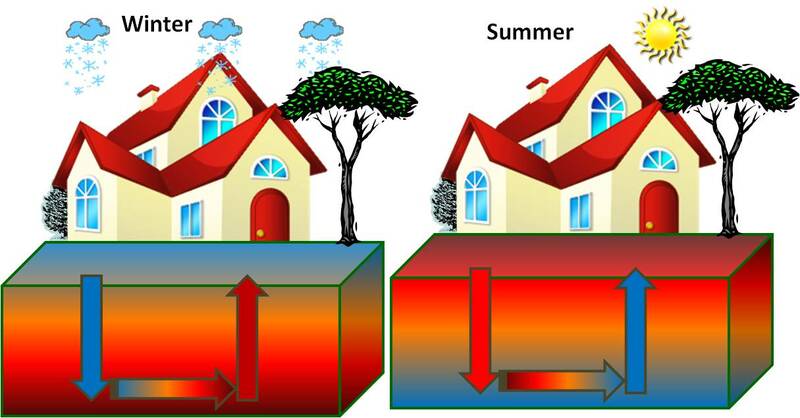 A geothermal heat pump system consists of a heat pump, an air delivery system (ductwork), and a loop of pipes buried in the ground near the building acting as a heat exchanger. In the winter, the heat pump collects heat through the buried pipes from the ground and pumps it into the indoor air delivery system. In the summer, the process is reversed, and the heat pump moves heat from the indoor air and release it into the ground through the buried piping systems. This removed heat from the indoor air can also be utilized by delivering it to the hot water system in the building. Klamath Falls, Oregon, USA: Klamath Falls, Oregon has one of the largest district heating system in the USA to heat city buildings. The production well is out of the town and hot water is brought to the town by pipeline. One the heat is used the water is returned to the reservoir through an injector well. The city also heats some of its sidewalks during winter using geothermal energy by running hot water pipes under them (Source: Geothermal Energy by Carrie Gleason, 2008). 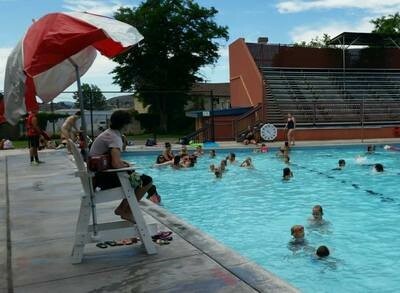 The City also uses this energy to heat its Ella Redkey Swimming Pool to keep it open year-round. Geothermal energy can be used to produce electricity. But high temperature is required to produce electricity that can only access from deep underground. Generally that heat is brought up by fluid circulation like water, oils etc. This heated fluid is then use to turn a turbine of a generator to produce electricity. When the fluid is cool it is returned to the heat source to repeat the process. Where the earth’s crust is thin these circulations exist naturally like hot springs or magma conduits. If not, an artificial well also can be drilled in to a hot aquifer and most part of the world the well need to be at least several kilometer deep for electricity generation. Therefore location is very important to establish an efficient and economically viable geothermal power plant.